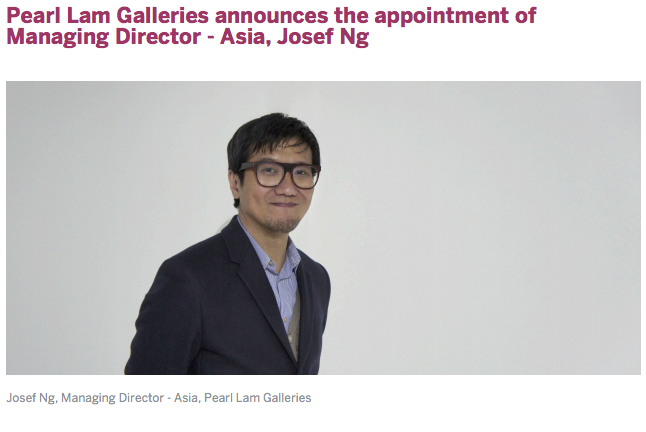 SINGAPORE—Pearl Lam Galleries is pleased to announce the appointment of Josef Ng as its Managing Director – Asia. Taking up the position in December 2015, Ng is based in Shanghai and Singapore, and will work alongside Gallery Founder Pearl Lam to develop key frameworks of the galleries, including curatorial and programming, business development, and marketing, across the four major exhibition spaces in Hong Kong, Singapore, and Shanghai. Prior to his role at Pearl LamGalleries, Josef Ng has served as the Director of Shanghai Gallery of Art. He also held positions as Artisticand Executive Director of Tang Contemporary Art, Director of Gallery VER in Bangkok, and co-founded an art curatorial/advisoryfirm,ARJHT.He has curated, amongst group shows, solo exhibitions for significant artists, such as Sun Yuan & Peng Yu, Yan Lei, Gao Weigang, Hou Chun Ming, Wang Du, Rirkrit Tiravanija, Navin Rawanchaikul, Sakarin Krue-on, and MAP OFFICE. A specialist in Asian Contemporary Art, Josef Ng is listed as one of the 55 cultural voices in Asia by Studio Voice, an Art and Culture publication based in Tokyo.